Save 7% Off For Exercise Bikes! Save 7% Off For Exercise Bikes from Sweatband.com. Use coupon code: Bike7 at checkout. Shop Now. Save 11% Off For Nordic Track from Sweatband.com. Use coupon code: NT11 at checkout. Shop Now. Save 6% Off For Proform Products! Save 6% Off For Proform Products from Sweatband.com. With coupon code: Proform6 at checkout. Shop Now. Save 5% Off For Tennis Rackets! Save 5% Off For Tennis Rackets from Sweatband.com. With coupon code: Tennis5 at checkout. Shop Now. Get 6% Off For Badminton Rackets from Sweatband.com. With coupon code: Badmin6 at checkout. Shop Now. Save 5% Off on NordicTrack! Save 5% Off on NordicTrack from Sweatband.com. With coupon code: NT-5 at checkout. Shop Now. Save 10% Off on Prince Team Peter Nicol Pro 700 Squash Racket!! Endorsed by former PSA world number 1 Peter Nicol, The Prince Team Peter Nicol 700 Squash racket is ideally suitable to a broad range of players with varying abilities/styles. We believe all can use and love this racket as much as we do! At 140g (4.94oz) in weight, this frame has great stability, yet being one of the most head-light balanced of Prince's frames, it also offers great manoeuvrability. It features two of Prince's most revolutionary racket technologies, EXO3, designed to add power to off centre hits and Power Ring designed to give added power but with consistent feel over the whole string bed, both of these technologies deliver significant improvements to your game. The racket has a 100% high modulus graphite frame and with an even balance it provides an excellent blend of power and control. Buy this and Save 10% Off on Prince Team Peter Nicol Pro 700 Squash Racket. Use coupon code: NICOL at checkout. Save 15% Off on DKN 6ft Olympic Chrome Barbell Bar!! The DKN 6ft Olympic bar is made from solid steel with a chrome finish and is suitable for 2" (5cm) Olympic weight plates and collars. The weight lifting Olympic bar is very durable and has a knurled handle so you can do barbell exercises in confidence. The bar weighs 15.7kg (34.6lbs). Buy this and Save 15% Off on DKN 6ft Olympic Chrome Barbell Bar. Use coupon code: 6FTBAR at checkout. Save 20% Off on DKN Studio Aerobic Step!! The DKN studio aerobic step has a large, durable platform constructed from reinforced plastic, with a non-slip surface. A huge number of exercises, including ones for improving cardiovascular fitness, can be undertaken on this piece of gym equipment, and its height can be adjusted by the 4 risers so you can choose a workout height of 10cm, 15cm or 20cm. The exercise stepper is a professional-style accessory, and despite its sturdy build it is lightweight for ease of use and storage. So buy this and Save 20% Off on DKN Studio Aerobic Step. Use coupon code: STEP at checkout. Save 15% Off on Viavito Heart Rate Monitor! Accurate heart rate measurement requires the use of the wireless chest strap and the one supplied with this product features an LED that flashes to indicate when it�s picking up readings. Unlike some chest straps on budget priced heart rate monitors with a sealed, built-in battery, the ViaVito chest strap has a user-accessible battery compartment. In addition to displaying heart rate levels being transmitted by the chest strap (in beats per minute), the watch provides a number of useful training functions. This includes a fat burning programme that is driven by inputting the user�s age to determine target heart rate during exercise to achieve fat burn. For maximum flexibility, there is a freely programmable target heart rate zone with audible and visual alarms indicating going outside of these levels as well as logging of an exercise session to record the duration of exercise within the zone, above it or below it. So buy this and Save 15% Off on Viavito Heart Rate Monitor! Use coupon code: HRM15 at checkout. Save 5% Off on Treadmills!! Save 5% Off on Treadmills from Sweatband.com. With coupon code: Tread-5 at checkout. Shop Now. Save 5% Off on Proform!! Save 5% Off on Proform at Sweatband.com. With coupon code: Proform5 at checkout. Shop Now. Made by the industry leading manufactures Sole, the Xterra Trail Racer 3.0 is their most inexpensive treadmill with no compromises on quality, components and warranty. It is powered by a 2.25 horsepower continuous duty motor that speeds the belt up to a maximum speed of 10mph (16kph) and powers 0-10% incline range providing users with the option to target different muscle groups. The Xterra Trail Racer has a large running area measruring 20" in width (over 50cm) and 55" in length (139cm), making for safe and comfortable workouts even for the tallest of users. It features XTRA Soft Cushioning with elastomers located under the treadmill helping to reduce any impact to joints and lets you measure heart rate with the hand pulse sensors. Stay hydrated and cool with the two conveniently located water bottle holders and the cooling fan. Additionally stay motivated by listening to your favorite music with the built in audio jack and speakers! So buy this and Save �50 Off on Xterra Trail Racer 3.0 Treadmill. Use coupon code: XT3-50 at checkout. Save 10% Off on Xterra Trail Racer 6.6 Treadmill!! The Xterra Trail Racer 6.6 treadmill is equipped with a 3.0 horse power continuous duty motor which speeds the belt up to 12mph (19.3kph). The 0-15% incline range enables you to target different muscle groups, while the large (20� x 60�) running area provides safe and comfortable workout sessions. The treadmill offers a great selection of 12 motivating programmes and is fitted with a 7.5� Blue Backlit LCD display offering feedback on key workout statistics. It features the XTRA Soft cushioning to guarantee that less stress is put on the joints, and incorporates the Lift Assist technology to make folding and unfolding quick and easy. The 6.6 allows for measuring heart rate with the hand pulse sensors or a wireless receiver with an included chest strap. Buy this and Save 10% Off on Xterra Trail Racer 6.6 Treadmill. With coupon code: XT6-10 at checkout. Save 7% Off on Tennis Rackets!! Save 7% Off on Tennis Rackets at Sweatband.com. With coupon code: TennisRackets7 at checkout. Shop Now. Save 7% Off on Rowing Machines!! Save 7% Off on Rowing Machines at Sweatband.com. With coupon code: Rowing-7 at checkout. Shop Now. Save �50 OFF HealthRider H150T Treadmill. The HealthRider H150T treadmill has some top features to get you motivated and your heart beating. Run at up to 22 kph/13.7mph on a 0-15% incline thanks to the powerful 3.0CHP motor, with speed and incline selectable in an instant via the quick buttons. The large running deck has FullStride� cushioning to absorb shocks and protect joints, and there are 30 pre-programmed workouts to tackle and iFit Live compatibility to make your session more interactive and interesting. The LED display shows your feedback including heart rate which is measurable via the pulse grips or the Polar� chest strap that is included. The built-in cooling fan, music port and speakers make exercising that bit more enjoyable, and the SpaceSaver� folding system is very practical. So buy this and Save �50 OFF HealthRider H150T Treadmill. With coupon code: H150T-50 at checkout. Save 5% Off on Gym Balls!! Save 5% Off on Gym Balls at Sweatband.com. With coupon code: GymBalls5 at checkout. Shop Now. Save 5% Off on Badminton Rackets!! Save 5% Off on Badminton Rackets at Sweatband.com. With coupon code: BadmintonRackets5 at checkout. Shop Now. Save �100 Off When You Spend �1,000!! 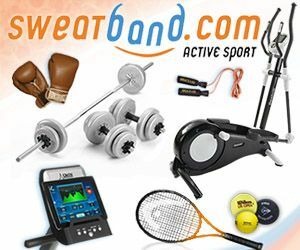 Save �100 Off When You Spend �1,000 at Sweatband.com. With coupon code: 100over1000 at checkout. Shop Now. Save �25 Off When You Spend Over �250!! Save �25 Off When You Spend Over �250 at Sweatband.com. With coupon code: 25over250 at checkout. Shop Now. Save �10 Off When You Spend Over �100 at Sweatband.com. Use coupon code: 10over100 at checkout. Shop Now. Save 5% Off on NordicTrack. Save 5% Off on NordicTrack Products at Sweatband.com. Use coupon code: NT-5 at checkout. Shop Now. Prince Team Peter Nicol Pro 700 Squash Racket. Endorsed by former PSA world number 1 Peter Nicol, The Prince Team Peter Nicol 700 Squash racket is ideally suitable to a broad range of players with varying abilities/styles. We believe all can use and love this racket as much as we do! At 140g (4.94oz) in weight, this frame has great stability, yet being one of the most head-light balanced of Prince's frames, it also offers great manoeuvrability. It features two of Prince's most revolutionary racket technologies, EXO3, designed to add power to off centre hits and Power Ring designed to give added power but with consistent feel over the whole string bed, both of these technologies deliver significant improvements to your game. The racket has a 100% high modulus graphite frame and with an even balance it provides an excellent blend of power and control. Buy this and Save 10% Off on Prince Team Peter Nicol Pro 700 Squash Racket. DKN 6ft Olympic Chrome Barbell Bar. The DKN 6ft Olympic bar is made from solid steel with a chrome finish and is suitable for 2" (5cm) Olympic weight plates and collars. The weight lifting Olympic bar is very durable and has a knurled handle so you can do barbell exercises in confidence. The bar weighs 15.7kg (34.6lbs). Buy this and Save 15% Off DKN 6ft Olympic Chrome Barbell Bar. The DKN studio aerobic step has a large, durable platform constructed from reinforced plastic, with a non-slip surface. A huge number of exercises, including ones for improving cardiovascular fitness, can be undertaken on this piece of gym equipment, and its height can be adjusted by the 4 risers so you can choose a workout height of 10cm, 15cm or 20cm. The exercise stepper is a professional-style accessory, and despite its sturdy build it is lightweight for ease of use and storage. Buy this and Save 20% Off on DKN Studio Aerobic Step. Save 15% Off on Viavito Heart Rate Monitor. Viavito Heart Rate Monitor. Accurate heart rate measurement requires the use of the wireless chest strap and the one supplied with this product features an LED that flashes to indicate when it�s picking up readings. Unlike some chest straps on budget priced heart rate monitors with a sealed, built-in battery, the ViaVito chest strap has a user-accessible battery compartment. In addition to displaying heart rate levels being transmitted by the chest strap (in beats per minute), the watch provides a number of useful training functions. This includes a fat burning programme that is driven by inputting the user�s age to determine target heart rate during exercise to achieve fat burn. For maximum flexibility, there is a freely programmable target heart rate zone with audible and visual alarms indicating going outside of these levels as well as logging of an exercise session to record the duration of exercise within the zone, above it or below it. Buy this and Save 15% Off on Viavito Heart Rate Monitor. Save 5% Off on Treadmills. Save 5% Off on Treadmills at Sweatband.com. With voucher code: Tread-5 at checkout. Save 5% Off on Proform Products. Save 5% Off on Proform Products at Sweatband.com. With voucher code: Proform5 at checkout. Shop Now. Save 10% Off on Xterra Trail Racer 3.0 Treadmill. Xterra Trail Racer 3.0 Treadmill. Made by the industry leading manufactures Sole, the Xterra Trail Racer 3.0 is their most inexpensive treadmill with no compromises on quality, components and warranty. It is powered by a 2.25 horsepower continuous duty motor that speeds the belt up to a maximum speed of 10mph (16kph) and powers 0-10% incline range providing users with the option to target different muscle groups. The Xterra Trail Racer has a large running area measruring 20" in width (over 50cm) and 55" in length (139cm), making for safe and comfortable workouts even for the tallest of users. It features XTRA Soft Cushioning with elastomers located under the treadmill helping to reduce any impact to joints and lets you measure heart rate with the hand pulse sensors. Stay hydrated and cool with the two conveniently located water bottle holders and the cooling fan. Additionally stay motivated by listening to your favorite music with the built in audio jack and speakers! The machine is fitted with a 6.5� Blue Backlit LCD display which lets you keep track of the crucial workout data such as pulse, time,calories, distance, speed, programmes, incline and a convenient � mile track display. The Trail Racer 3.0 offers a selection of 9 programmes (Manual, 6 Pre-set: ascent, glute blast, adventure, xtreme, x country and interval + 2 User-defined) to keep you engaged and entertained. So buy this and Save 10% Off on Xterra Trail Racer 3.0 Treadmill. With coupon code: XT3-50 at checkout. Save 10% Off on Xterra Trail Racer 6.6 Treadmill. Xterra Trail Racer 6.6 Treadmill. The Xterra Trail Racer 6.6 treadmill is equipped with a 3.0 horse power continuous duty motor which speeds the belt up to 12mph (19.3kph). The 0-15% incline range enables you to target different muscle groups, while the large (20� x 60�) running area provides safe and comfortable workout sessions. The treadmill offers a great selection of 12 motivating programmes and is fitted with a 7.5� Blue Backlit LCD display offering feedback on key workout statistics. It features the XTRA Soft cushioning to guarantee that less stress is put on the joints, and incorporates the Lift Assist technology to make folding and unfolding quick and easy. The 6.6 allows for measuring heart rate with the hand pulse sensors or a wireless receiver with an included chest strap. Buy this and Save 10% Off on Xterra Trail Racer 6.6 Treadmill. Use coupon code: XT6-10 at checkout. Save 7% Off For Tennis Rackets. Save 7% Off For Tennis Rackets at Sweatband.com. With coupon code: TennisRackets7 during checkout. About Tennis Rackets: High tech materials are now commonplace and extremely affordable, and a good racket, if re-stringed regularly, can last several years. Obviously frequency of play, power behind your play and the climate in which you play will all impact on your racket�s lifespan. So if you�re new to the game and need advice on what to buy or if your last racket has lost its edge, here�s a short sharp guide to help you find the best for you�. The main aspects to consider are head size, length, weight distribution, grip size and material. Save 7% Off on Rowing Machines. Save 7% Off on Rowing Machines at Sweatband.com. With coupon code: Rowing-7 during checkout. About Rowing Machines: If you�re serious about exercising and training they�re actually a great investment because of the huge variety of muscle and range of movement their use involves. When you row effectively you generate power through your legs, transfer it through the torso and on to the arms. Rowing machines are low impact, meaning there is minimal stress on your joints. That said they are not for the novice or uninitiated as the complexity of movement is such that poor use resulting from bad technique can actually put strain on your knees and back. Save �50 OFF on HealthRider H150T Treadmill. HealthRider H150T Treadmill. The HealthRider H150T treadmill has some top features to get you motivated and your heart beating. Run at up to 22 kph/13.7mph on a 0-15% incline thanks to the powerful 3.0CHP motor, with speed and incline selectable in an instant via the quick buttons. The large running deck has FullStride� cushioning to absorb shocks and protect joints, and there are 30 pre-programmed workouts to tackle and iFit Live compatibility to make your session more interactive and interesting. The LED display shows your feedback including heart rate which is measurable via the pulse grips or the Polar� chest strap that is included. The built-in cooling fan, music port and speakers make exercising that bit more enjoyable, and the SpaceSaver� folding system is very practical. So buy this and Save �50 OFF on HealthRider H150T Treadmill. With coupon code: H150T-50 at checkout. Save 5% Off on Gym Balls. With coupon code: GymBalls5 at checkout. About Gym Balls: Exercise balls remain a firm favourite amongst the physiotherapy fraternity, as well as featuring in group exercise classes at most health clubs. They�re a popular training tool for serious sports folk and a growing number of homes have one too. But even when your primary muscles for an exercise are elsewhere, the core has to keep working. Try a press up on a mat and then on a ball and you�ll experience the difference. Save 5% Off on Badminton Rackets. With coupon code: BadmintonRackets5 at checkout. More About Badminton Rackets: We offer a comprehensive range of badminton rackets from top brands such as Yonex, Ashaway, Carlton and Wilson. All rackets come with free UK delivery at the lowest prices possible. Save �25 Off When You Spend Over �250. Save �25 Off When You Spend Over �250 at Sweatband.com. Use coupon code: 25over250 at checkout. So Shop Now. Save �10 When You Spend Over �100. Save �10 Off When You Spend Over �100 at Sweatband.com. With coupon code: 10over100 at checkout. So Shop Now. Prince Team Peter Nicol Pro 700 Squash Racket. Endorsed by former PSA world number 1 Peter Nicol, The Prince Team Peter Nicol 700 Squash racket is ideally suitable to a broad range of players with varying abilities/styles. We believe all can use and love this racket as much as we do! At 140g (4.94oz) in weight, this frame has great stability, yet being one of the most head-light balanced of Prince's frames, it also offers great manoeuvrability. It features two of Prince's most revolutionary racket technologies, EXO3, designed to add power to off centre hits and Power Ring designed to give added power but with consistent feel over the whole string bed, both of these technologies deliver significant improvements to your game. The racket has a 100% high modulus graphite frame and with an even balance it provides an excellent blend of power and control. So buy this Squash Rackets and Save 10% Off on Prince Team Peter Nicol Pro 700 Squash Racket. With coupon code: NICOL at checkout. DKN 6ft Olympic Chrome Barbell Bar. The DKN 6ft Olympic bar is made from solid steel with a chrome finish and is suitable for 2" (5cm) Olympic weight plates and collars. The weight lifting Olympic bar is very durable and has a knurled handle so you can do barbell exercises in confidence. The bar weighs 15.7kg (34.6lbs). Buy this product and Save 15% Off on DKN 6ft Olympic Chrome Barbell Bar. Use coupon code: 6FTBAR during checkout. DKN Studio Aerobic Step. The DKN studio aerobic step has a large, durable platform constructed from reinforced plastic, with a non-slip surface. A huge number of exercises, including ones for improving cardiovascular fitness, can be undertaken on this piece of gym equipment, and its height can be adjusted by the 4 risers so you can choose a workout height of 10cm, 15cm or 20cm. The exercise stepper is a professional-style accessory, and despite its sturdy build it is lightweight for ease of use and storage. So buy this product and Save 20% Off on DKN Studio Aerobic Step. With coupon code: STEP at checkout. Save 15% Off on DKN 5ft Standard Bar. DKN 5ft Standard Bar. The DKN 5ft standard bar is made from solid steel and has a chrome finish for great strength and durability. The weight lifting bar comes with spinlock collars for quicker plate changes and improved safety. It is great for a range of barbell exercises, weighs 7.3kg (16lbs), and has a diameter of 1" (2.5cm) and a maximum loading limit of 125kg (275.5lbs). Buy this product and Save 15% Off on DKN 5ft Standard Bar. Use coupon code: 5FTBAR at checkout. Viavito Heart Rate Monitor. This heart rate monitor from Viavito is a feature-packed training tool at a very affordable price, representing impressive value for money! Accurate heart rate measurement requires the use of the wireless chest strap and the one supplied with this product features an LED that flashes to indicate when it�s picking up readings. Unlike some chest straps on budget priced heart rate monitors with a sealed, built-in battery, the ViaVito chest strap has a user-accessible battery compartment. In addition to displaying heart rate levels being transmitted by the chest strap (in beats per minute), the watch provides a number of useful training functions. This includes a fat burning programme that is driven by inputting the user�s age to determine target heart rate during exercise to achieve fat burn. For maximum flexibility, there is a freely programmable target heart rate zone with audible and visual alarms indicating going outside of these levels as well as logging of an exercise session to record the duration of exercise within the zone, above it or below it. Buy this product and Save 15% Off on Viavito Heart Rate Monitor. Use coupon code: HRM15 at checkout. Save 10% Off on Nordic Track. Save 10% Off on Nordic Track from Sweatband.com. Use coupon code: NT-10 at checkout. Shop Now. Save 5% Off on Treadmills from Sweatband.com. With coupon code: Tread-5 at checkout. So Shop now. More About Treadmills & Running Machines: One of the most popular machines used by gym goers, the treadmill is becoming a fixture in an increasing number of homes. Treadmill running is continuing to gain popularity for numerous reasons: Running on a treadmill burns calories faster than most other types of exercise machines. It�s an easy and intuitive piece of exercise equipment to use. Kinder to joints than running on the pavement or roads. Shielded from having training programme being disrupted by unreliable outdoor weather. Save 5% Off on Proform Product!! Save 5% Off on Proform Product from Sweatband.com. With coupon code: Proform5 at checkout. Shop Now. Xterra Trail Racer 3.0 Treadmill. Made by the industry leading manufactures Sole, the Xterra Trail Racer 3.0 is their most inexpensive treadmill with no compromises on quality, components and warranty. It is powered by a 2.25 horsepower continuous duty motor that speeds the belt up to a maximum speed of 10mph (16kph) and powers 0-10% incline range providing users with the option to target different muscle groups. The Xterra Trail Racer has a large running area measruring 20" in width (over 50cm) and 55" in length (139cm), making for safe and comfortable workouts even for the tallest of users. It features XTRA Soft Cushioning with elastomers located under the treadmill helping to reduce any impact to joints and lets you measure heart rate with the hand pulse sensors. Stay hydrated and cool with the two conveniently located water bottle holders and the cooling fan. Additionally stay motivated by listening to your favorite music with the built in audio jack and speakers! The machine is fitted with a 6.5� Blue Backlit LCD display which lets you keep track of the crucial workout data such as pulse, time,calories, distance, speed, programmes, incline and a convenient � mile track display. The Trail Racer 3.0 offers a selection of 9 programmes (Manual, 6 Pre-set: ascent, glute blast, adventure, xtreme, x country and interval + 2 User-defined) to keep you engaged and entertained. Buy this Treadmill and you can Save 10% Off on Xterra Trail Racer 3.0 Treadmill. With coupon code: XT3-50 at checkout. Xterra Trail Racer 6.6 Treadmill. The Xterra Trail Racer 6.6 treadmill is equipped with a 3.0 horse power continuous duty motor which speeds the belt up to 12mph (19.3kph). The 0-15% incline range enables you to target different muscle groups, while the large (20� x 60�) running area provides safe and comfortable workout sessions. The treadmill offers a great selection of 12 motivating programmes and is fitted with a 7.5� Blue Backlit LCD display offering feedback on key workout statistics. It features the XTRA Soft cushioning to guarantee that less stress is put on the joints, and incorporates the Lift Assist technology to make folding and unfolding quick and easy. The 6.6 allows for measuring heart rate with the hand pulse sensors or a wireless receiver with an included chest strap. So buy this Treadmills and Save 10% Off on Xterra Trail Racer 6.6 Treadmill. With coupon code: XT6-10 at checkout. Save 7% Off on Tennis Rackets from Sweatband.com. With coupon code: TennisRackets7 at checkout. Shop Now. More About Tennis Rackets: In the early era of tennis rackets were crafted individually, but as the game grew in popularity and means for manufacture were improved tennis rackets became more standardised. High tech materials are now commonplace and extremely affordable, and a good racket, if re-stringed regularly, can last several years. Obviously frequency of play, power behind your play and the climate in which you play will all impact on your racket�s lifespan. So if you�re new to the game and need advice on what to buy or if your last racket has lost its edge, here�s a short sharp guide to help you find the best for you�. The main aspects to consider are head size, length, weight distribution, grip size and material. NordicTrack Elite 12.5 Elliptical Cross Trainer. Target different muscle groups with the power incline ramp on the NordicTrack Elite 12.5 elliptical cross trainer and vary your workouts to great effect. Set incline from 0-20 degrees to work the calves, hamstrings or thighs, and choose the angle of the pedals to personalise each workout further. 24 levels of magnetic resistance, selectable via 1-Touch� controls, 32 pre-programmed workouts and iFit Live compatibility offer more variety to keep you challenged. The fan automatically adjusts to your speed to cool you down, and you can listen to your music via the audio port and the built-in speakers. View your data on the 6�� backlit display and measure heart rate using the dual EKG� sensors or the included Polar chest belt. The cross trainer is easy to assemble and the transport wheels help with moving it. So buy this and Save �100 Off on NordicTrack Elite 12.5 Elliptical Cross Trainer. With coupon code: NTE-100 at checkout. The HealthRider H150T treadmill has some top features to get you motivated and your heart beating. Run at up to 22 kph/13.7mph on a 0-15% incline thanks to the powerful 3.0CHP motor, with speed and incline selectable in an instant via the quick buttons. The large running deck has FullStride� cushioning to absorb shocks and protect joints, and there are 30 pre-programmed workouts to tackle and iFit Live compatibility to make your session more interactive and interesting. The LED display shows your feedback including heart rate which is measurable via the pulse grips or the Polar� chest strap that is included. The built-in cooling fan, music port and speakers make exercising that bit more enjoyable, and the SpaceSaver� folding system is very practical. So buy this Treadmill and Save �50 OFF HealthRider H150T Treadmill. With coupon code: H150T-50 at checkout. Save 5% Off on Gym Balls. Save 5% Off on Gym Balls from Sweatband.com. With coupon code: GymBalls5 at checkout. More About Gym Balls: In relative terms the gym ball is a newcomer to the exercise family. Also called a Swiss ball this versatile piece of kit was first used in Switzerland in the 1960s for infant physiotherapy. Back then manufacturing costs meant it was still a (relatively) pricey piece of kit but as these have fallen the gym ball has enjoyed an exponential rise in popularity and number of uses. Exercise balls remain a firm favourite amongst the physiotherapy fraternity, as well as featuring in group exercise classes at most health clubs. They�re a popular training tool for serious sports folk and a growing number of homes have one too. Save 5% Off on Ab Training Equipment. Save 5% Off on Ab Training Equipment from Sweatband.com. With coupon code: AbTraining5 at checkout. More About Ab Training: Those who want to build, tone and strengthen their abdominal muscles can choose among many exercise tools that make abdominal training much easier and comfortable. Ab trimmers do not take much place at home and are equipped with a padded headrest that offers support for the neck and back during performing crunches, which reduces strain within these areas. Sit up bars can easily be attached to the door and they have foot rests that enable you keep your feet in place while performing exercises such as sit ups and crunches. With Roman chairs you can not only target the lower abs, but also strengthen the lower back. Sit up benches are recommended for those, who have back problems and are unable to do abs exercises on the floor. Save 5% Off on Badminton Rackets. Save 5% Off on Badminton Rackets from Sweatband.com. With coupon code: BadmintonRackets5 at checkout. So Shop Now. And We offer a comprehensive range of badminton rackets from top brands such as Yonex, Ashaway, Carlton and Wilson. Save �25 Off When You Spend Over �250 at Sweatband.com. Sweatband.com is the ultimate active sports equipment super store! The Sweatband range covers multiple sports and includes tennis equipment, badminton equipment, squash equipment, Golf equipment and fitness equipment. All major brands are represented including Head, Wilson, Nordic Track, Suunto, Life Fitness and Slazenger to name a few.